Editors: Mackay, Ian, Rose, Noel R. and Diamond, Betty, et. al. 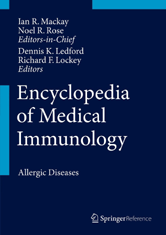 The volume explores all aspects of allergic diseases, body systems and vaccines. Emphasis is placed on genetics, physiology, metabolism, pathogenesis, and applied microbiology. Under the leadership of some of the most world renowned names in the field, the encyclopedia brings together an outstanding collection of contributions by top scientists in a variety of fields.